Jack Baldwin in action for Posh against Preston. Photo: Joe Dent/theposh.com. 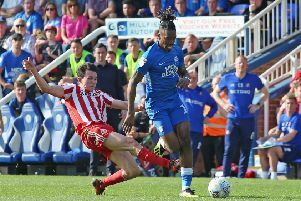 Peterborough United manager Graham Westley has warned his player to beware a ‘wounded animal’ at the ABAX Stadium on Saturday (January 16). In-form Posh will start as hot favourites to beat a Southend side whose form has collapsed in recent weeks. Former Posh striker Tyrone Barnett is in the Southend squad. But Westley insists that just means Saturday’s visitors to the ABAX will be dangerous opponents. “Southend are a team I know very well,” Westley stated. “They knocked my Stevenage side out of the League Two play-offs last season and beat us in the league on their pitch. “They were a very good side then and they’ve done very well this season. It doesn’t surprise me as they have good players and a good manager. “And although they’ve had some poor results lately, there is no way we will under-estimate them. “Just because we won at Sheffield United in our last league game, and then got the better of Preston last week, doesn’t mean that we just have to turn up to beat Southend. “Football doesn’t work like that very often. It has a habit of kicking you when you least expect it. Phil Brown (Southend boss) is a very experienced manager and he got stuck into his players after their defeat last week for a reason. “He will want and expect a reaction and I am confident he will get one. Westley could have experienced central defender Michael Bostwick available again after a short injury break. Bostwick pulled a calf muscle during the Christmas defeat at Walsall, but was expected to return to training today (January 14). But he might not walk straight back into the side as Westley was thrilled with Jack Baldwin’s contribution in the win over Preston. “I’ve seen many players come back from long-term injuries, but very few that have come back as well as Jack,” Westley added. “Watching his last two performances you would not have known he had been out for 14 months. “Being patient with him has worked as he had trained and worked hard for two months before he got back into the side. Southend should include former Posh million-pound man Tyrone Barnett on their starting line up. The striker scored on his Southend debut in last Saturday’s (January 9) 4-2 defeat at Swindon. Barnett scored for Shrewsbury at the ABAX Stadium last month, but has now moved to Roots Hall on loan for the rest of this season. Southend have lost their last three matches by an aggregate score of 11-2.